Artist Annie Elizabeth Hoyle began working for the Forest Service in 1908. 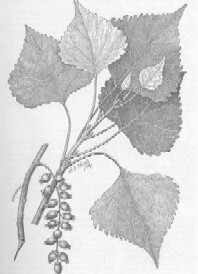 Her pen and ink sketches illustrated many of George B. Sudworth's volumes, including The Pine Trees of the Rocky Mountain Region, as well as the Forest Trees series fathered by Wilbur Mattoon. She completed more than 160 drawings of range plants for the Division of Range Research. Dr. Arthur W. Sampson chose her paintings for the frontispieces of his textbooks, Range and Pasture Management and Native American Forage Plants. The Hunt Institute for Botanical Documentation at Carnegie Mellon University has 546 illustrations created by A. E. Hoyle during her Forest Service career. Evidently, she enjoyed working for the agency. She requested five extensions of time when she reached retirement age. These extensions enabled her to work until she turned 80. She retired from the Forest Service on August 31, 1930. Born before the Civil War, on a small farm near Charles Town, West Virginia, Annie attended Maryland public schools and the Louden Park Seminary in Baltimore, before starting formal art training. She began her art education in Washington, D.C. at the Rouzee School of Fine Arts, before moving to New York to study under George H. Story at the National Academy of Design. Traveling abroad, she received training in human anatomy and anatomical drawing at the Royal Academy in London, and spent two years studying in Paris and Luxembourg. Mrs. Hoyle received her training in systematic botany, and plant morphology from Joseph Painter of the U.S. National Museum (Smithsonian), and Ivar Tidestrom at the Bureau of Plant Industry. Daytonious. "Annie E. Hoyle Retires", in the Service Bulletin, U.S. Forest Service, (Washington, D.C.) vol. 14, No. 35, Sept. 2, 1930, p.7.